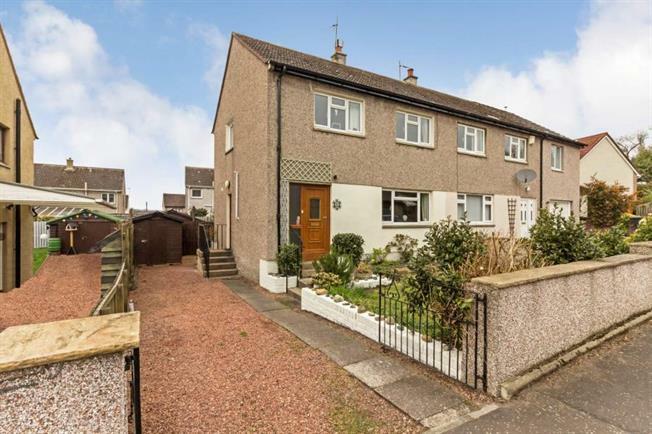 3 Bedroom Semi Detached For Sale in Linlithgow for Offers Over £239,000. An immaculately presented three bedroom semi detached home that is ideally situated in a preferred central location with Linlithgow High Street just a short walk away. Offering extensive family accommodation over two levels, this fine home extends to a bright reception hallway, a lovely well proportioned living room leading to the dining room with feature focal point duel aspect wood burner. The dining room then leads to the timber decking and rear grounds thereafter via a pair of patio doors. A fabulous modern fitted kitchen that forms the heart of this ideal family home, comes with an array of wall and floor units with complementary worktops. The upper floor provides a contemporary styled newly fitted family bathroom and three generously proportioned bedrooms all with integrated storage. There is excellent storage provision throughout. This charming home is brought to the market in true walk in condition with bright, fresh dcor throughout. Fixtures and fittings are to a first class standard with excellent attention to detail. Quality floor coverings throughout are included within the sale. On a practical note the home benefits from double glazing and gas central heating. To the front is an extensive chipped driveway which provides ample off street parking. The remaining front grounds are to lawn with well stocked flower beds. The rear, more private west facing gardens are mainly laid to lawn with a generous decked area, slabbed sun terrace, appealing mature flower beds and a substantial insulated timber shed with power & plumbing that lends its self to a wide range of uses. A timber fence provides additional security and privacy as well as a child friendly environment. Linlithgow offers a wide selection of amenities that cater for day to day needs. There are public transport links via bus and rail, with a nearby rail link offering direct access to Edinburgh, Glasgow and Stirling city centre's. There are a number of recreational pursuits to be found including rugby, football and golf clubs. There are many pleasant walks to be found around Linlithgow Palace, along with a fine selection of bars and restaurants.